In a country known for duality, it is only fitting that there are two main fashion weeks in India. 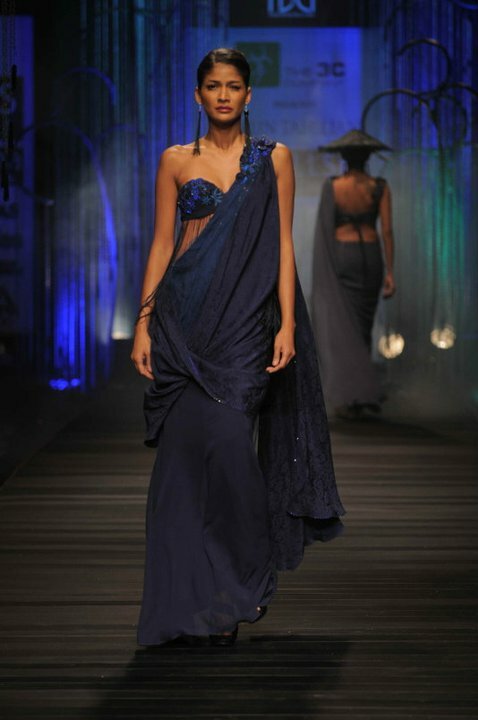 The Mumbai mavens have Lakme Fashion Week, which occurred in March, showing Summer/Resort 2011 collections. (Read my Lakme 2011 posts thus far.) Meanwhile, Delhi divas are donning their designer duds for Wills Lifestyle India Fashion Week, which started today and runs until April 10th, showcasing Autumn/Winter 2011 collections. Judging by the first round of shows today, I can see a distinct energy coming from these clothes. The New Frida? at Rehane AW11. 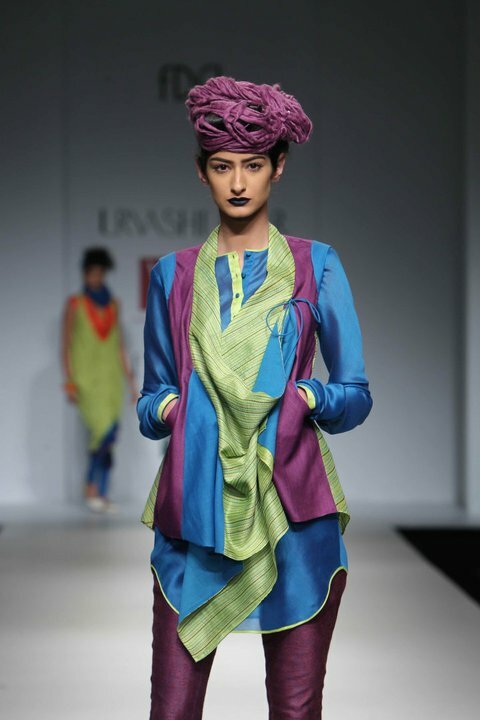 The classic kurta and vest combo gets an upgrade at Urvashi Kaur AW11. 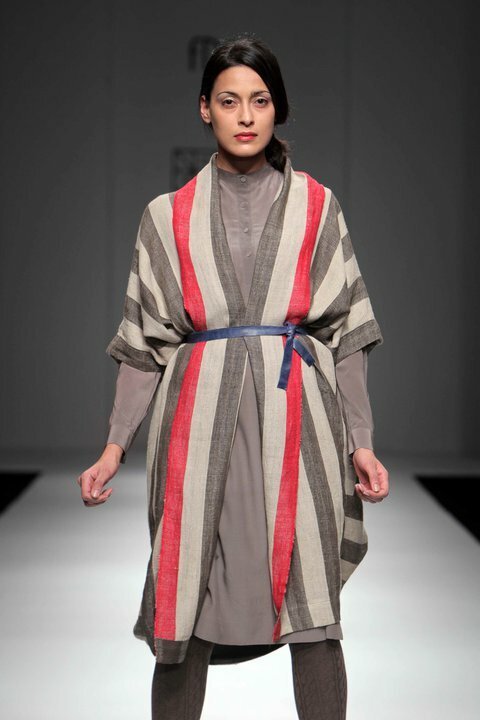 The history of craft is woven into the fabric of India, but things are starting to get haute. Pankaj and Nidhi AW11. There is a definite ode to the past – and respect for craft and heritage. What is more evident, however, is the search for a new presence, of a revised notion of what Indian fashion is. 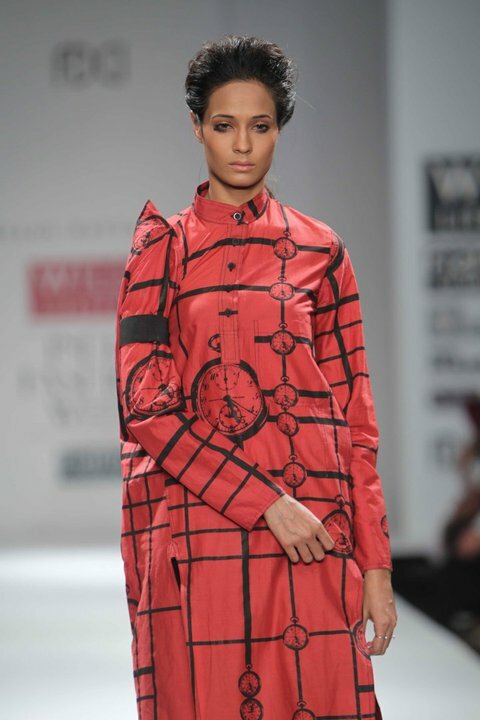 Time to change your perception of Indian fashion - Kallol Dutta - one of my favourites. Glen plaid returns at Rishta by Arjun, with a new spin on the 'tail' coat. Fashion forward (although it would be more dramatic over a black trouser). This checkered dress checks off many trends for next season, and yet still manages to look original. Pankaj and Nidhi. Before you ask, this is already on my list for Fall. Neeru Kumar, you may be my next soul sister. Now, the new India is certainly not news – but there are new designers each season – and with them, a crop of fresh ideas and dreams. The event will feature over 75 runway presentations, with 141 designers taking part in the week’s activities. While some may not yet have the clarity of vision as an Anamika Khanna or the brand heft of a Tarun Tahiliani or the cult following of a JJ Valaya or Rohit Bal, there is a freshness of thought – and mostly – a determination of spirit that I am starting to see in these collections. Interesting play on the salwaar, harem pant and capri at Akaaro by Gaurav Jai Gupta. 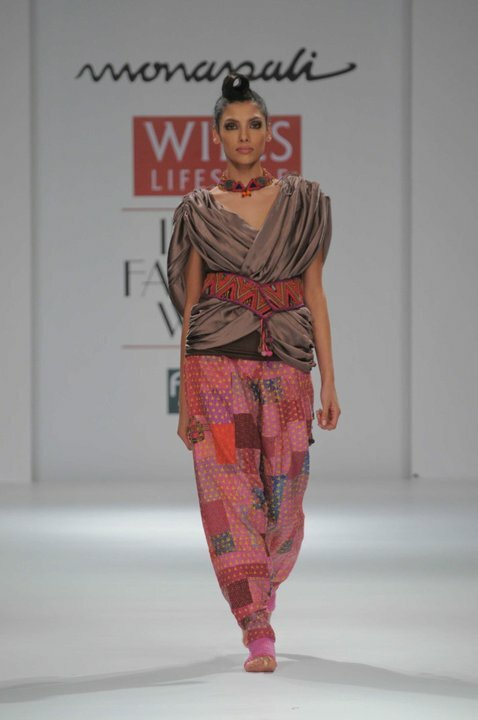 Draped blouse and patched salwaar pants at Monapali AW11. 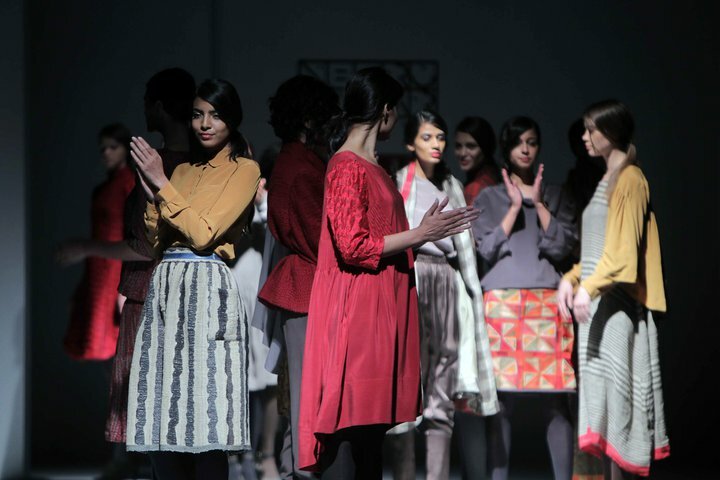 Tuned in at Urvashi Kaur AW11. There is an emergence of a voice here, and another voice there and yet another in the distance. And sure enough, these individual voices are starting to sound like a cohesive crowd. 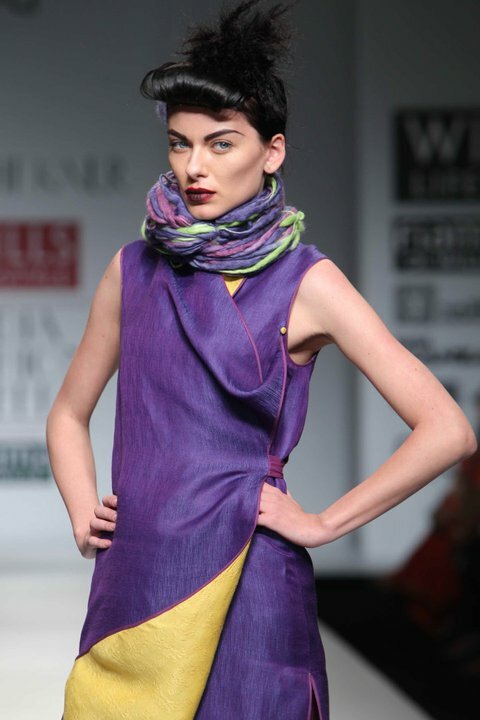 You mauve me: Geisha Designs by Paras and Shalini. Neeru Kumar - at any length. Day One ended with the master, Tarun Tahiliani, who showed us his classics including saris. Look at the sheer layer of fabric underneath the bustline. Tahiliani took us to China, adding his embellished twist to trusted tailoring. 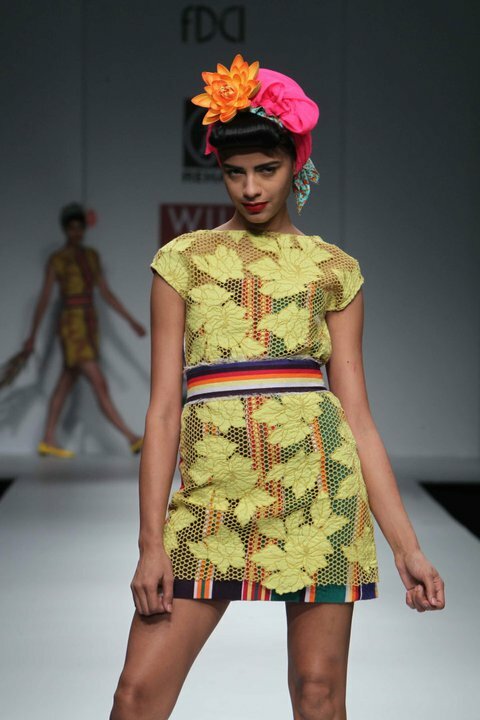 Fashion in India: marching to the beat of different drum. Varun Bahl's black and white runway army for AW11. All images courtesy of WLIFW.